Andrew Hauze ’04 is alarmingly still in his desk chair. Brow furrowed, finger to chin, his vibrant, chatty, and decidedly musical demeanor is reduced to pianissimo. He ponders, for a full 45 seconds, just who he can call his favorite composer. Somewhere outside, a truck is beeping, backing up. Finally he decides: Mozart. He has much in common with the classical maestro, particularly in the prodigy department. Hauze began serious score-reading study with an orchestra conductor at age 11 and enrolled in college music-theory courses in eighth grade, details the pianist mentions offhandedly, as if they were strokes of luck. After receiving his B.A. in music at 19, Hauze entered the prestigious Curtis Institute in Philadelphia for an intensive three-year degree program in conducting. He returned to Swarthmore in 2006 to conduct the orchestra and has stayed on. At first, he also worked full time as a church musician, thanks to his organ-playing acumen (a skill he picked up at 14). Now he’s full time at the College, in a half-staff, half-faculty position: He manages the Lang Concert Hall and serves as an associate in performance—teaching orchestra and wind ensembles, coaching chamber-music groups, overseeing several independent studies, and sometimes teaching a music theory or an orchestra-conducting class. As a part of the College’s sesquicentennial celebration, Hauze advised a concert performance of South Pacific Feb. 15 and 16. Those concerts, accompanied by the College orchestra, were paired with a faculty symposium on the cultural significance of the work, which is based on James A. Michener ’29’s short story collection Tales from the South Pacific. 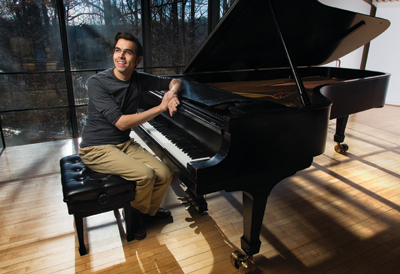 The pianist/conductor spoke to the Bulletin’s Carrie Compton about his connection to Swarthmore—a bond that began for him at age 5, when his family dropped off his oldest sibling for her freshman year. 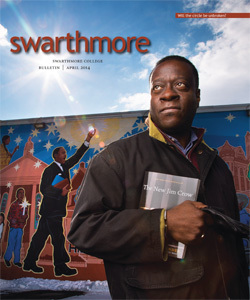 Tell me about your time at Swarthmore as a teacher. I didn’t realize how much I would end up loving teaching. Since I was a student, the music program has not changed dramatically, but I think the small ways it has changed have been really great. One of the things I love about this faculty is that every year we spend so much time thinking about how to refine the program. We’re really trying to broaden our curriculum. For example, we’re very strong on Western classical music, and I think we need to be that strong: We’re a small college, and we can’t possibly do everything, and what we do we should do well. At the same time, it’s really important that we have more offerings from all over the world and from different traditions, so we’re striving for diversification without any loss of vigor. That’s the balancing act we need to maintain. Your siblings also graduated from Swarthmore —explain your personal connection to the College. My personal connection is very deep—both my sister [Susannah Hauze Hogendorn ’93] and my brother [Jonathan ’98] went here, which was an enormous influence. When my brother was here, I spent a few days sleeping on his floor in Mary Lyon, and I thought, “This is such a great place! You can go to the dining hall and eat hot dogs every day!” I’d already decided I wanted to be a conductor, so I convinced my brother to check out some scores from the music library and let me take them home until his next break. So actually, I was already studying the music we have here when I was in middle school. How did you know in middle school that you wanted to be a conductor? My dad was a pastor in the United Church of Christ, so I grew up with a lot of music from the church. And there was always music in the house. I started piano lessons at 6; I don’t remember being particularly interested or gifted at it. But when I was 9, my brother got the lead in The Music Man at his high school. For some reason I insisted upon also auditioning, and they were nice enough to put me in the chorus. I absolutely fell in love with everything—the music, the theatrical aspects, and the orchestra. I just thought it was the greatest thing ever. But I thought one person clearly had the best job: the conductor. It just so happened that for my final two years of high school, I ended up focusing on music at Simon’s Rock College, in Barrington, Mass., which is an early college for 16 and 17 year olds. Simon’s Rock is a lot like Swarthmore academically, but it’s extremely small, only 350 students, and about two-thirds of the student body transfer to larger schools after two years. So you’re two years younger than your class? I talk to prospective students a lot, and I try to impress upon them that you have to really have some sense of what kind of college experience you’re looking for, because this small, residential liberal arts school is wonderful, but you have to be looking for that. Our orchestra will probably never be bigger than 70 kids, but we can offer a really vigorous experience both musically and in a broad academic way. What are some of your projects on campus right now? A major project for me is getting music out of this building [Lang Music Building] and onto the wider campus and into the world. I take chamber groups out to play all over campus—I had a cello group play in Sharples, and my wind quartet played in the bell tower one day. Performing in the concert hall, you can hear a pin drop, but if you play in Sharples, it’s less stress. Plus, we get great reactions—I find that many of [the students’] peers didn’t even know they were musicians. Fewer than 10 percent of the students in the orchestra and wind ensemble are music majors, and the rest just love to make music. We have tie-ins with local retirement homes and with homes for people with disabilities. Their residents attend our concerts, but we’re trying to get our student chamber music groups to play off campus in that regard as well. I also started doing very informal, sporadic, 15-minute-long lunchtime concerts in Parrish in the parlors about a year ago. They’re really fun. The concerts give me the chance to play for anyone who wants to stop by, and I’ve been bringing some students in to play with me, which has been really, really fun. What’s the one thing you hope students take away from your teaching? An attitude and ethic of engaging art on all levels. I want to show students that if I’m conducting a piece for orchestra, not only have I learned the score, but I’m still learning from the score—always re-evaluating and questioning what it actually means. I also strive to be fluent in the composer’s life and the cultural history of when a score was written and how it’s constructed. I try to create new ways of questioning things, which in music can be very slippery. Everybody can listen to music, but what are you actually hearing? And how are you listening to it? The thing I love about teaching music theory on any level is that you can always pull in a lot of music that everybody knows and loves, and say, “You may know how ‘Happy Birthday’ goes, but here’s why this moment is so good, here’s why it’s not so interesting if you do it this way.’ ” It gives students a sense of how lasting art is really made. To read Andrew Hauze’s book review of “On My Way”: The Untold Story of Rouben Mamoulian, George Gershwin, and Porgy and Bess, click here. Watch Andrew Hauze’s cello chamber group take on Sharples click here. Amazing! simply loved it. beautifully written. This piece introduced me to vibrant and musical culture you people have there and contributions of Mr. Andrew are remarkable (I don't know him directly and never knew about this aspect of his personality especially). Being a fan of western classical music, I enjoyed every sentence of this article. Hope Mr. Andrew succeeds in his mission of bringing music out of this college. Cheers from this side of the world.